Xinjiang Astronomical Observatory (XAO) and the National Radio Astronomy Observatory (NRAO) signed the “Memorandum of Agreement for Scientific and Technical Consultation on the Planned Qi-Tai Radio Telescope (QTT) Astronomical Radio Telescope” On September 10th, 2013. After deep communication and negotiation, Both sides reached agreements on strengthening staff and student exchanges, technical consultation as well as equipment development. The content of the MOU can be expanded according to the needs of both sides. The signing of the MOU marks the scientific and technical communication between XAO and NRAO has taken a step forward in the field of radio astronomy. 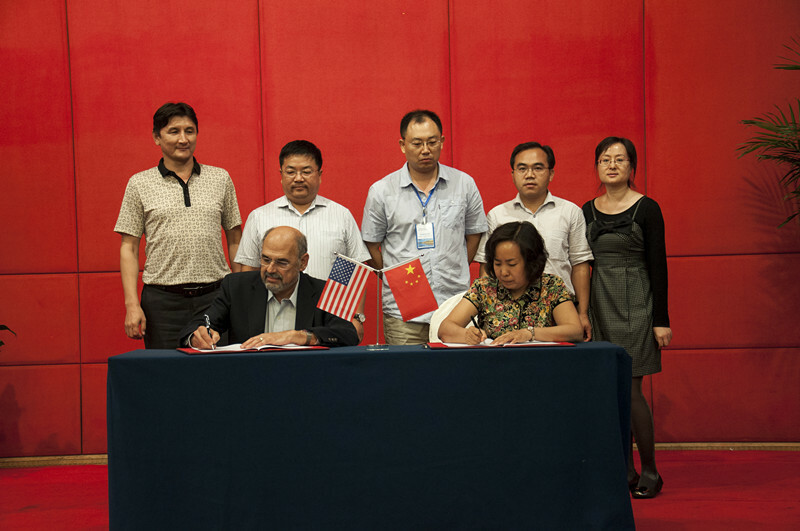 XAO and NRAO have a long-term exchange and communication relationship and a good cooperation foundation. Both the sides are the members of the Global Centimeter-wave VLBI network, devoting themselves to promoting the development of astronomy and astrophysics. Through strengthening the further communication with NRAO on the aspects of science, technology, management, operation, and enhancing close cooperation on the potential field, such as joint-project, XAO will realize the goals of talent training and continuous development.